Some of that might be legible. I’ll digitize the data and read it in here on another occasion. Meantime, you see a shadow of our public look. All our “self”-published flyers were printed by me on a Quaker owned multilith run by some anarchists down on W 18th Street or so. I’ve mentioned them all along in this set of posts: they operated mainly out of a church on Sheridan Square, 4th, off 7th. The church hosted lots of groups, the anarchists were also sponsored by the Quakers, and it was the anarchists who controlled the press. If they hadn’t supplied the paper and the ink andthe press and the knowledge of how to operate it, we couldn’t have had our FLEXW newsletters and so forth. We were supposed to pay as we could, we never could. That’s why you have the pentagon’s fake internet today instead of politically free internet Illich described and I offered. 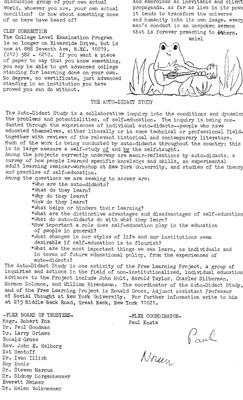 Meantime: understand: Illich touted self-learning. So do I. In my own learning history I learn despite the teacher more than because of the teacher. I have nothing against teachers: my opposition to “teaching” echoes Illich’s opposition to the automatic assumption that a teacher is required in all circumstances. Hiring a teacher, tolerating a teacher “should” be a free market decision: like you can put salt on your potato if you want to: you should have to submit forms to a bureaucracy, or get a note from your doctor. This entry was posted in DeCentral, deschool, pk Teaching, social order, society. Bookmark the permalink.